In this blog article, I will shortly describe my most important folders within my home folder. I won't say that this is the only structure that makes sense. I won't say that my structure is completely self-consistent. However, it's the structure I came up with, when I tried to find a minimal hierarchy that is able to scale over the years. To my knowledge and the confusion related to the related terms, there is no definitive definition for "directory" or "folder". When the desktop metaphor was developed in the 1970s, there was a distinction how things are represented in the lower-level operating system and how things are represented in the newly developed graphical user interface. "Directory" is a term that is used in the context of a file system. "Folder" is often used as a term for a directory or a so-called virtual folder of a user interface. Therefore, when no concepts like virtual folders are used, "folders" and "directories" are usually synonyms. I use them as synonyms in this article as well. Research shows that people prefer navigating personal folders instead of searching for files. PIM research suggests to have around 21 items per folder and enough folder to store all of your data but not more. You should find a trade-off between deeply nested folder hierarchies with fewer items per folder and shallow hierarchies with too many files per folder. I do have many folders that violate these rules. For example, most of my folders to have way more items that 21. So far, I personally don't have issues with that because I use search (locate very often, and seldom DocFetcher), filter (shell wildcards, dired filter, filetags filter and TagTrees) and direct links (memacs) to get along quite fine while having many files in one folder. Windows is providing various My Documents folders: Documents, Pictures, Music, Videos. Apple macOS has similar folders that are set-up for every user. So why not use those pre-defined folders? Here is my highly subjective answer. From what I have learned reading many PIM studies and books, the design and naming of those pre-defined folders was not influenced by specific research results. My personal point of view is that this structure does not make any sense. Let's use an example use-case. I manage files that are related to a given birthday party. Those files consists of photographs and videos from peers as well from my own mobile, scanned bills of the birthday present, maybe a scanned invitation letter, and so forth. Why should I follow the separation according to content type (Documents, Videos, Pictures, ...) and split up those files into separate top sub-hierarchies of my user folder? According to the pre-defined folders, I ought to store party photographs in Pictures/, move the video of Julia blowing out her birthday candles to Videos/, and move the scanned files somewhere below Documents/. In my opinion, this does not make any sense. Alternatively, I might decide that the "dominant" information type of those birthday party files is "Pictures". Therefore, I create one sub-folder Pictures/2018-07-23 Julia Birthday/ and move all birthday files into this folder. In this case, I have to remember to navigate into Pictures/ when I actually want to retrieve her birthday party video which actually might indicate navigating to Videos/ instead. I might be able to have this cognitive mapping in my brain but I really don't want to. This is why I do think that curating and re-accessing personal items has not any priority when designing commercial operating systems. Further more, my personal habit of designing my own folder structure is older than any pre-defined folder structure on Windows. Back in the old days, the default storage folder when saving a document in Microsoft Word was its program binary folder. Therefore, doc files were stored in C:\WORD60\, spreadsheets were stored within D:\DBASE3\CALC\, images in C:\MS\MSPAINT\ and so forth. I did not like that at all. So I started my own structure with C:\KV\ which developed over time. My current structure is approximately my seventh more or less consciously designed hierarchy (educated guess). Lots of stuff is only of interest for a certain period of time. These are things like downloads for quickly skimming through its content, unpacking ZIP files to examine the files contained, minor interesting stuff, and so forth. For this temporary stuff I do have the $HOME/tmp/ sub-hierarchy. Photographs are moved from my camera to $HOME/tmp/digicam/. There, I tag and rename them before they get moved to their archive folders. Stuff I temporary copy from a CD, DVD, or USB memory stick are put in $HOME/tmp/fromcd/. Whenever a software tool needs temporary data within my user folder hierarchy, I use $HOME/tmp/Tools/ as an starting point. A very frequently used folder for me is $HOME/tmp/2del/: "2del" means "ready for being deleted any time". All my web browsers are using this folder as default download folder. In case I need to free space on a machine, I firstly look at this 2del-folder for stuff to delete. The most important sub-hierarchy within my archive is $HOME/archive/events_memories/ and its sub/folders like 2017/, 2018/, 2019/, and so forth. As you might have guessed already, there is one sub-folder per year. Within each of them, there are single files and folders. The files are named according to my file name convention described in this blog article. Folder names start with an ISO 8601 datestamp in the form "YYYY-MM-DD" followed by a hopefully descriptive name like $HOME/archive/events_memories/2019/2019-07-22 Business run with colleagues/. Within those date-related folders I keep all kinds of files which are related to a certain event: photographs, (scanned) PDF-files, text files, and so forth. In other words: files in sub-folders of 2019/ are related somehow. Like a scanned invitation letter as PDF, bills of a present and all photographs of a birthday party. Files directly within 2019/ don't have related files so that they need to be stored in a sub-folder. Within my $HOME/templates_labels/ sub-hierarchy, I keep all kinds of template files (LaTeX, scripts, ...), cliparts and logos, and so forth. 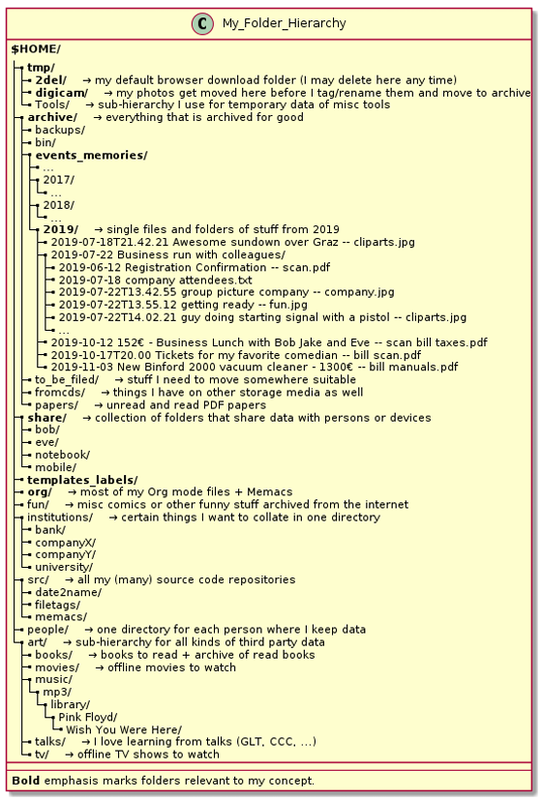 My Org mode files, I mostly keep within $HOME/org/. I practice retentiveness and do not explain how much I love Emacs/Org-mode and how much I get out of it this time. You probably have read or heard me elaborating the awesome things I do with it. Just look out for my emacs tag on my blog and its hashtag #orgmode on twitter. Of course there is more. Other not so important sub-hierarchies are not explained here. The described folder hierarchy is not the first one I am using. I have designed and used much more complicated hierarchies for many years. The current one is the most simplistic one. Further more, despite the fact that I now use it for about a decade, it still feels like a suitable structure that suits my requirements quite well. You can find many things that may be questionable choices ("why putting talks under art/ ..."). The main aspect is, that I personally am able to re-find stuff within this hierarchy. So far, re-finding stuff within my hierarchy is not a problem to me. You most probably want to read this blog article as well, where I explain workflows using my various tools on managing files within my folder hierarchy. This makes my digital life a very easy one.